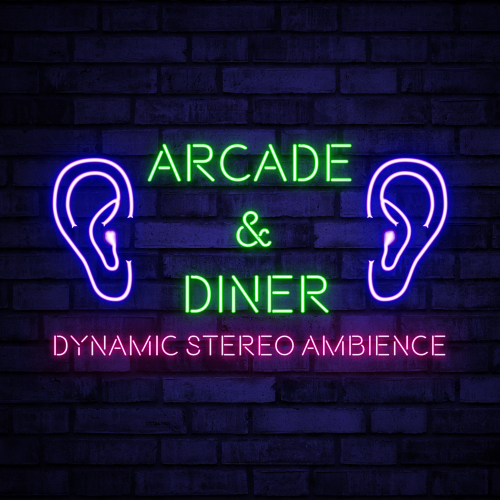 This is an hour long ambience Mp3 file, I mixed several sources of a diner and an arcade together with a dynamic left to right panning mix on 4 tracks, especially useful when you've set up a home cinema / audio set which has the ability of spreading 2 channel stereo to the back speakers as 4 channel stereo. When the dynamic panning sets in it comes really close to a real surround mix, it makes the ambience feel more realistic with depth. Now I haven't tested the file yet with headphones on so be warned, it might not be a suitable mix for this as you might hear too much detail where the rough panning wasn't performed well. so where would this apply? I've never used any music or anything in launchbox,...would this be a blanket launchbox backround song playing the whole time? Just fire up the mp3 with your media player of choice. I haven't tried it within Launchbox or Big Box as it might complicate things too much, this way you can control volume separately and the audio keeps on playing. @Kondorito Check this out, I found out how to mix it even better and this time in real 5.1 Dolby Digital, not sure if you have a 5.1 set but if you do here's a test sample (just playing around nothing serious yet), perhaps it's even better with headphones as well. Currently at work; could test it later on, trying it now with headphones, and I really like it. There is some crossfading between L and R.
I would rather have the Arcade sounds louder than the diner ones, but I really like it overall Awesome job!